Pharma Nolt 300 is a powerful injectable steroid consisting of 4 nandrolone esters that are activated one after the other. Due to the combination of esters of different lengths, the components of the drug enter the bloodstream gradually over a long time, which allows for rare injections. The body itself can produce natural nandrolone in response to intense physical exertion, but its level remains quite low – only a few milligrams per milliliter of urine. Pharma Nolt 300 is mainly used in heavy sports practice, especially in bodybuilding. Athletes appreciate it for its ability to increase muscle gain. Also, the drug is used in traditional medicine to strengthen bone tissue and ligaments, it is prescribed to patients with osteoporosis and other diseases. In the preparation pharma nolt 300, the composition consists of 4 components – decanoate, propionate, laurate, phenylpropionate. 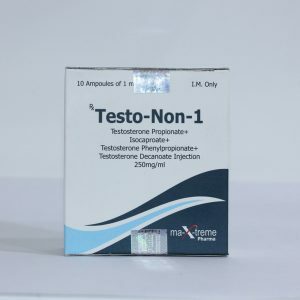 Steroid is characterized by a pronounced anabolic effect – 150% of testosterone, with moderate androgenic activity – 30%. The drug has a minimal tendency to aromatization, due to its injection form does not have a toxic effect on the liver. Steroid acts in the body for 2 weeks, it is possible to detect an anabolic agent for doping control after 1.5 years. 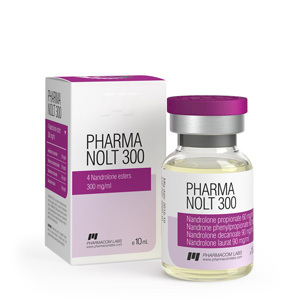 Pharma Nolt 300 acts identically to Sustanon 250, in other words, it comes into operation from the very first days of the course, maintaining a consistently high level of the active component throughout the entire period of activity. The main effect of the steroid is aimed at stimulating muscle growth, raising the overall tone of the body. The rapid increase in muscle mass. On average, for the course of farmanolt 300 solo, an athlete manages to gain an average of 8 kg of musculature, while the “rollback” after the course is minimal. Increased production of synovial fluid. This effect allows you to eliminate pain in the joints, improve the condition of the ligaments. By increasing the production of collagen significantly strengthened bone tissue. The protective functions of the body are increased. Significantly increased endurance and strength. The drug pharmanolt 300 increases the oxygen mass in the blood, which leads to an improvement in the transport of oxygen to muscle tissue. For this reason, the athlete will be able to significantly extend the time of training without the “acidification” of the muscles. To achieve greater effect, experienced athletes recommend using a steroid in combination with Sustanon, Winstrol, Methandrostenolone. PharmaNolt 300 Pharmacom Mix is ​​taken on average for 2 months. Steroid injections must be given every week at a dosage of 400 mg. Experienced athletes may exceed the dosage, but this will only increase the risk of adverse reactions. The maximum allowable weekly dosage of the drug is 600 mg. It should be borne in mind that in one ml of the solution contains 300 mg of active substance. Athletes can take a steroid in dosages of 50 mg every 10 days, gradually you can increase the dose to 75 mg.